The 2017 Great American PitchFest June 23-25 | Announces Line-up + Schedule! One of the most highly anticipated Hollywood screenwriting events is returning this year – The 2017 Great American Pitch Fest at the Los Angels Marriot Burbank Airport location June 23-25, 2017. Entering their 14th year, this epic screenwriter event brings together some of the industries TOP production companies, agents, managers, financiers and decision makers looking to option, buy and/or hire as writers. Nearly 2,000 writers travel from around the world each year to participate in ScriptFest and the Great American PitchFest which also have events held in Canada and the UK. The upcoming event in Los Angeles is the largest event of its kind, specifically for screenwriters, and anyone can attend. ScriptFest and the Great American PitchFest were created by writers for writers. The event started in Canada with the first Great Canadian PitchFest in 2003. Fourteen years later, the event has expanded to Los Angeles, California and London, England. The event has helped thousands of writers from around the globe to connect with industry decision makers. ScriptFest, the ScriptFest Master Series, and the Great American PitchFest were started as a way to help other writers move their careers forward, and make ‘finding the door’ just a little bit easier. Writers who have attended the event have been hired for writing assignments, signed with agents or managers and have had their screenplays optioned. In a business that is defined primarily through the relationships creatives have with one another, thousands of writers that have attended one of their events have helped launch their careers. 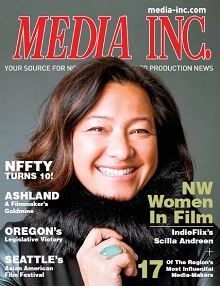 MEDIA INC MAGAZINE this year is honored to be a media sponsor by continuing their global support of indie filmmaking and creatives in the industry. We got a chance to catch up with the leadership team of SIGNE OLYNYK (Co-Founder) and BOB SCHULTZ (President) to share with us more about their upcoming event. MEDIA INC MAGAZINE: Tell us about GAPF and why it’s been such a big draw for screen writers over the years? Bob: When Signe started the event 14 years ago in Canada (I joined the organization with the first American event), she already had the magic formula: We are writers ourselves, so any questions about what we should do or offer should always be seen through that prism. We believe in the importance of writing. And we always remember that improving the quality of spec screenwriting overall will result in more opportunities for spec screenwriters individually. We offer the best classes, the best panels, the most pitching opportunities. We are grateful to all the writers who have come to our event over the years. We couldn’t do it without them. MI: How do screenwriters prepare for this event? What should they bring? We interview all of our executives about what types of material they are looking for, whether a writer needs an agent or manager to approach them, stars or directors they have relationships with, advice for new writers – all sorts of questions like that. And then we publish this information on our website, and as a booklet that is distributed at the event. We try to do this research for our writers so they can really pinpoint who is the best fit for their various projects, and that way, they can hone their pitches to make sure they are pitching their work to the executive who is the best fit. If anyone wants to see what these various companies are looking for, they just need to click on the various companies who are attending, and read their profiles. As far as what a writer needs to bring to the event, I recommend that they have two hard copies of their script available to them at all times – one on them, and one in an easily accessible place, such as a car or hotel room. The reason I suggest this is because if an execs requests a copy of the script and prefers a hard copy, it’s great if you are able to hand it to them on the spot. It shows you are ready, serious, and that you have it ready to go. It is not uncommon to see execs reading hard copies of scripts during the break. Now, most execs tend to prefer an electronic copy. But if one asks for a hard copy, it’s great to be able to have one available right away to give to them. I also recommend having a USB drive with you at all times with the latest versions of your script so you can send a copy electronically, immediately following the meeting. The other thing that I recommend is a one-sheet, which is essentially a flyer for your script – a visual representation of your story. They need to have your name, contact information, title, tagline, and a brief logline or synopsis. They aren’t essential, but they are a very helpful selling tool. And once the exec goes back to the office, it can assist them with re-pitching it to others who they work with. I also recommend bringing mints, bottled water, comfortable shoes to wear, and business cards. Companies attending in 2017 HERE! Q: Do writers and attendees need to have a literary agent to pitch the executives? A very successful strategy that many of our writers have used to get an agent or manager at the event is to use the morning pitchfest to meet with production companies and distributors. Once they have a number of script requests, they can then use the afternoon to meet with the agents and managers. In those meetings, they can talk about the various script requests, and how they now need an agent or manager to send those script requests out. When a writer is pitching an agent or manager, they want to pitch differently than if they are pitching to a production company. Production companies will want to know the log-line, and will be thinking about the story, budget, packaging it with talent, directors, and other production details. But an agent or manager will be thinking about those things AND whether they can represent you and your script. They want to know that you can write to deadline, that you generate a lot of excellent material, that you are a solid writer, that you pitch well, are good in a room, and that you can hustle and get your script out there. A great writer will tailor their pitch so that it suits the person they are pitching, and fits with what they are looking for. MI: Tell us about the panels and your special guests this year. We are thrilled to be offering classes to help writers improve their creativity, their characters, and their story arcs. We have plenty of pitch classes and classes on writers’ legal rights and strategies for them to market themselves. And, of course, we are honored to have working screenwriters join us. Steve Oedekerk (Jimmy Neutron: Boy Genius, Bruce Almighty, Kung Pow: Enter The Fist) will be there to talk about his career in comedy and animation, and Oscar Winner Dustin Lance Black will be joining us as well. CLASSES + GUESTS + PANELS HERE! MI: You also have a LONDON GAPF. Can you tell us about that event and how it works. The Great British PitchFest is part of the London Screenwriters’ Festival. The market for screenplays – the film industry as a whole, really – is a global phenomenon. Our mission to help writers means ALL writers. Not just American writers, and not just writers of a certain age or financial status. Our outreach includes scholarships to high school writers from low-income areas, special rates for veterans. We have taught screenwriting all over the world: The USA, Canada, Sweden, Romania… the list goes on.